Speyside is the area around the River Spey in Moray and Badenoch and Strathspey, in the North-East of Scotland. It is an area known for its beautiful scenery, great food and people but is probably best known for its whisky. 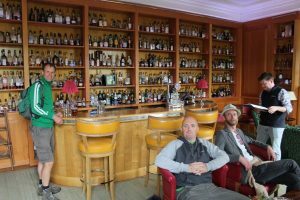 We first properly discovered single malt at the Whisky Lounge talks and samplings at Beacons Festival and a subsequent trip to Islay last year. 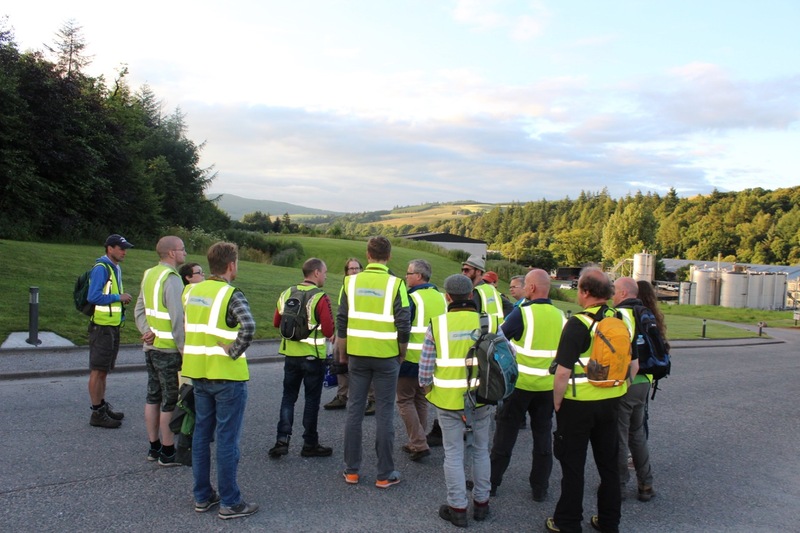 Speyside was the next logical destination for us. We found though that Speyside had a whole lot more to offer than just the ‘water of life’. 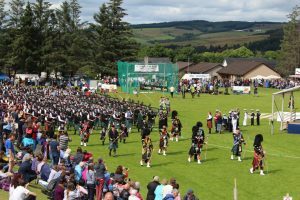 Picturesque villages, stunning walks and some excellent country pubs and hotels, combined with a trip to the Highland Games made this a trip to remember. We set out for the long drive North up through the Highlands and the vast, beautiful National Park of the Cairngorms to our campsite, Aberlour Gardens, nestled very conveniently in whisky country. The campsite itself is very pleasant and well located – situated within a walled garden and inhabited by an incredible number of campers from Germany and all over Europe and beyond. 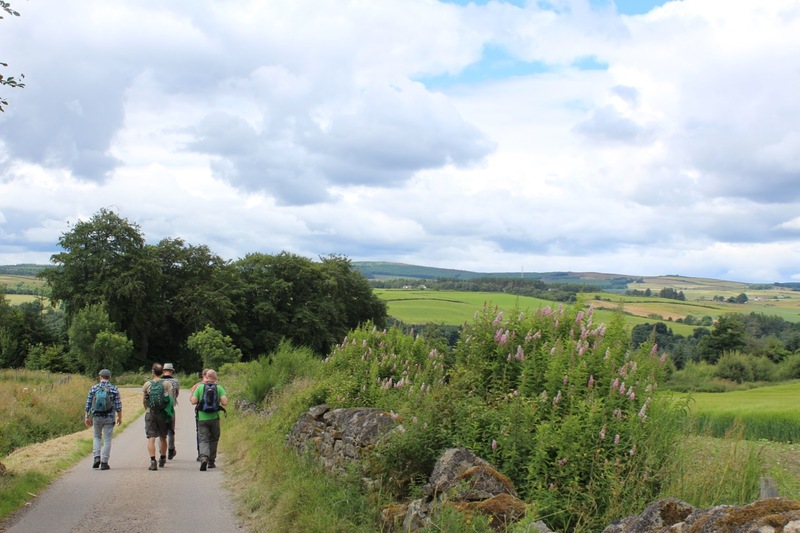 The campsite is a short walk through some picturesque countryside to get onto the old railway track. 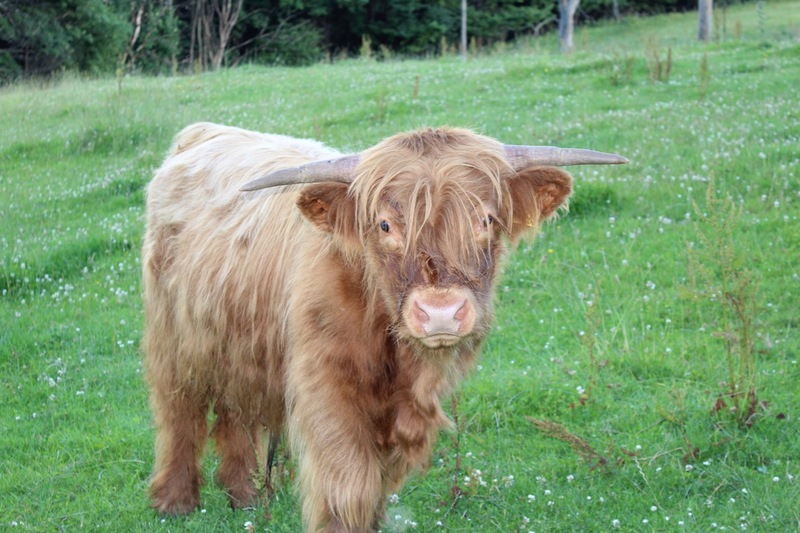 This takes you between distilleries and some excellent hotels and pubs. On the first evening, we had a wander down to the Mash Tun on the banks of the Spey in Aberlour. This is a small pub but with a great choice of whisky. 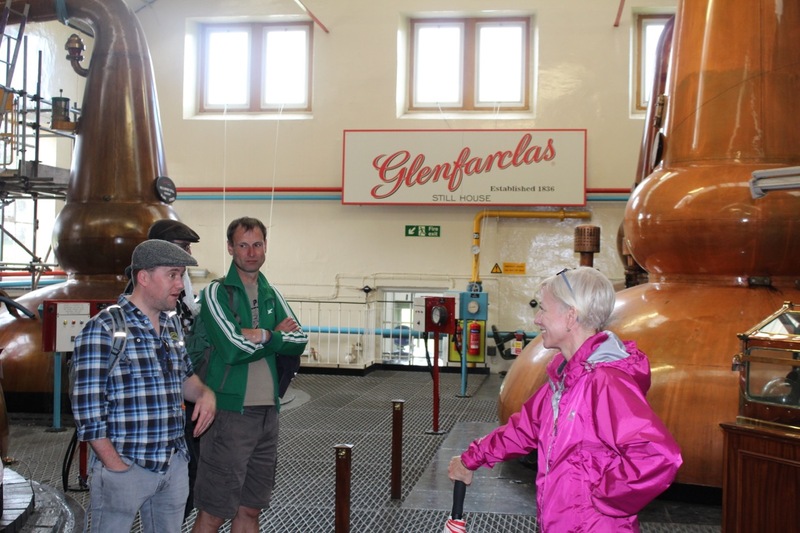 It has an incredible range of the local Glenfarclas and apparently some whisky themed accommodation. It was a good start to our trip as we sampled one of our favourite local drams, the Glenfarclas 15 year and some local ales. The following day, we headed out for a walk around to get our bearings and discovered the delights of the Highlander Inn. We loved this place as it had a relaxed atmosphere and a good place to sit outside before the midges descended in the evening. The pub is managed by a gentleman from Japan and aside from a fine collection of local whisky, there are also some excellent Japanese single malts. Japanese whisky continues to grow in popularity and standing, giving even the historic distilleries of Scotland a run for their money. We had a wander down the rail track and discovered a real gem. 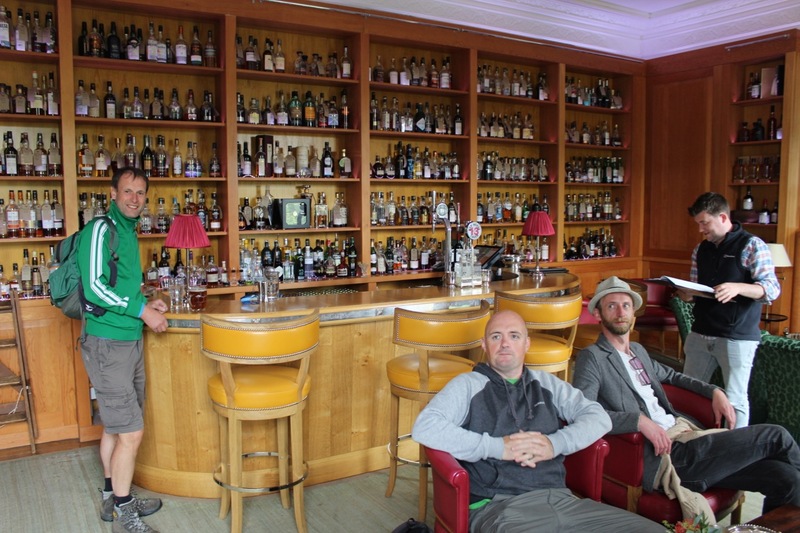 The lovely Copper Dog bar at the beautiful Hotel Craigellachie was having some renovations done to it, but the very friendly staff invited us upstairs to their incredible whisky room, showcasing some of their 750 bottle collection. The oak panel walls are lined from floor to ceiling with this amazing collection of whisky of all kind of ages and types. It was quite fantastic to see this opulent and quirky sight. It also had a splendid balcony looking out over the tree-lined hills. We were in our element. A little further out, the Fiddichside Inn is also well worth a mention – this little pub was first taken over by the Brandie family in 1919 and was run by daughter Dorothy and her husband Joseph from 1964. Dorothy sadly passed away in 2011 aged 89, but Joseph continues to run the pub. There is lots of whisky to try, have a chat with Joseph and sit out in the beautiful pub garden next to the river – just watch out for the evening midges! Having suitably scoped out the local establishments, we went in search of some more whisky history and local knowledge. We booked Dufftown Taxis to take us over to Dufftown for a tour. These guys were great and are bolstered by using T5’s to ferry visitors around this beautiful region. We got dropped off at the town hall clock in the centre of Dufftown just in time for the start of the whisky walk. 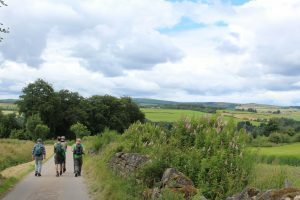 This three mile trek takes in nine local distilleries and around fifteen samples of whisky from the local area. It was a real DIY tour by local lady Michelle who really knew her stuff. The tour began in her garage to collect a lanyard, glass and high-vis jacket and we proceeded to walk around the various distilleries of the likes of Glenfiddich and Mortlach but mainly the outsides and taking in some stunning scenery, history and banter along the way. We tasted, saw and heard all about the how whisky is so important to the areas past and present. At the end of our trip, our T5 taxi dutifully collected our party and delivered us back to the campsite. 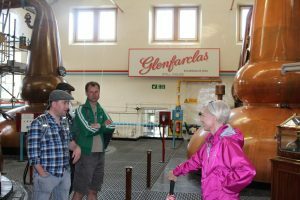 We also took their T5 to visit the family run Glenfarclas distillery, which had a great tour and tasting at the end of it. 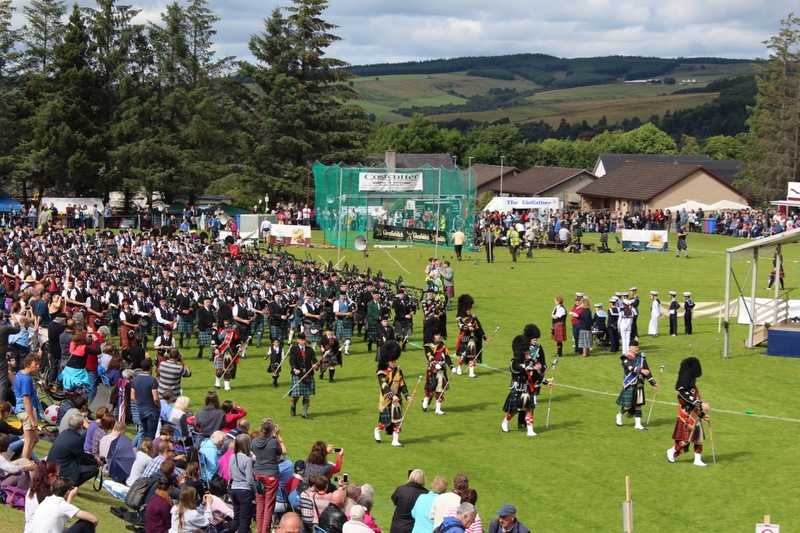 On the final day, we did the four mile hike over the hill for the Dufftown Highland Games. One of our party had decided to enter the fell run, so we waited dutifully, watching the Scottish dancing, piping, hammer throwing and tug of war and watching the runners come in one by one. Of course there was whisky to be sampled in the sunshine. Our friend entered the arena to rapturous applause to complete the race, somewhat battered and bruised from a very difficult fell run over several peaks and fourteen miles. He was just in time for a whisky and then a walk into Dufftown where the pipers were marching up and down the streets. 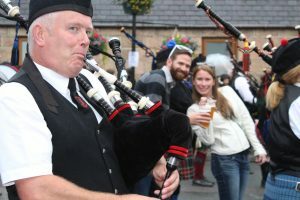 This was an incredible scene and we caught up again with a honeymoon couple who had come all the way from Texas and got their chance to be part of the massive procession of pipers. This was a great conclusion to a very memorable trip. It is easy to see why so many people from abroad visit this area – there is so much to see and do whether you love the whisky or not. For those that love the water of life though, there is only one Speyside. It’s a good drive North, but everyone agreed, well worth it. I’m sure we’ll be back.